Looking for a stylish compact car with smart fuel efficiency? The 2016 Honda Civic and 2016 Toyota Corolla offer individuals and families across America affordable options with smart technology features available. Take a look at these two 4-door, 5-seaters as we compare their features, safety ratings, MPG, and more. Both popular compact cars designed for carrying up to 5 people, the 2016 Honda Civic and 2016 Toyota Corolla offer a similar size, with the Civic featuring a sharp new style in the 2016 model year, with strong angles and a sporty stance. Overall, “The 2016 Honda Civic drops almost all the economy-car pretense” and “In Touring trim, it could easily wear a premium label,” as reviewed by The Car Connection, giving the 2016 Civic an Expert Rating Breakdown of 8.8 out of 10, with a 9.0 in Styling, 8.0 in Performance and 10 in Safety, as compared to the overall review of the 2016 Toyota Corolla at 7.4, with only a 6.0 in Styling and Performance and an 8.0 in Safety. Highly competitive in the market, both vehicles offer convenient technologies standard with all trim levels, each with their own media streaming system, Bluetooth, Smartphone Connectivity, 60/40 Split Fold Rear Seats, and even a Power Moonroof with Tilt feature that is standard on the 2016 Civic EX models and above and on the 2016 Corolla LE models and above. While both models come standard with cruise control, the 2016 Civic also features available Adaptive Cruise Control with Low Speed Follow (select models) to automatically adjust your speed to the vehicle in front of you. In addition, the new Honda Civic Sedan brings an added feature standard on all models, the Multi-Angle Camera with three distinct rear angles: normal, top-down, and wide-angle, allowing for greater driver visibility behind you. A backup camera is available on the Toyota Corolla, however not on their base model, so you have to upgrade to at least the LE model for this feature. While style and features are important, we know that keeping yourself and your loved ones as safe as possible is naturally a top-of-mind factor in vehicle purchase decisions, so we have thoroughly compared the safety ratings for these two vehicles, and have displayed the results below. 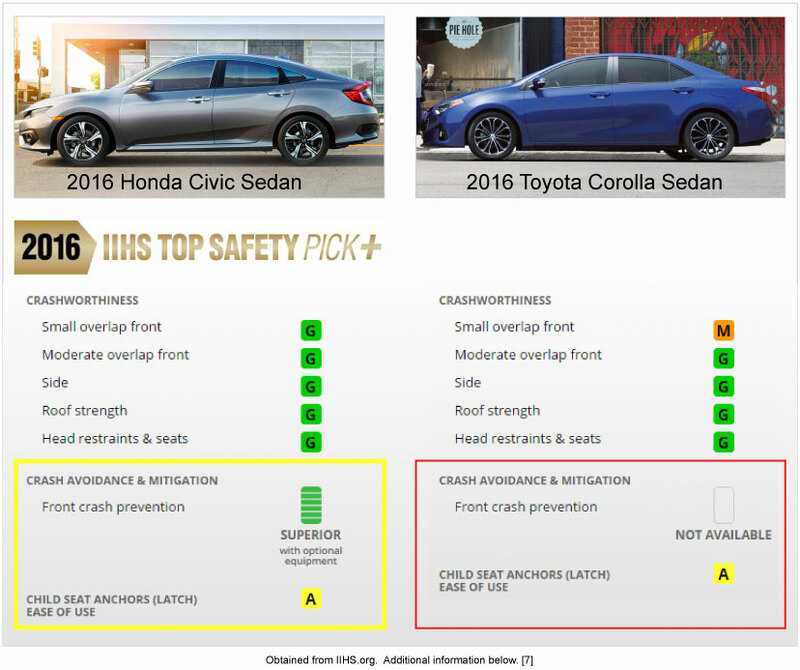 While both the Civic and Corolla offer a suite of standard and available safety features for enhanced driver and passenger protection, Honda continues to showcase its safety advancements with the 2016 Honda Civic Sedan receiving an IIHS top “Good” rating in all Crash Worthiness categories and achieving the top “Superior” rating in Crash Avoidance and Mitigation. The Civic’s results were so outstanding, the International Institute of Highway Safety (IIHS) named the new Honda Civic with its top award, 2016 Top Safety Pick Plus. The Toyota Corolla’s safety results were fairly solid yet less favorable, with only a “Marginal” in the Small Overlap Front category, and a “Not Available” in Crash Avoidance and Mitigation. In addition, while both vehicles received overall 5 star crash ratings from the National Highway Traffic Safety Administration (NHTSA), the Corolla only received 4 stars in the Rollover category, while the Honda Civic excelled with 5 stars in every category, reinforcing once again Honda’s advanced engineering and the Honda Civic’s superior quality. With both environmental and financial interests motivating an ever-growing focus on fuel efficiency, we detailed the fuel ratings for these two smart sedans. Exact mpg estimates vary by model trim levels, with the 2016 Civic Sedan boasting up to: 40 MPG Hwy (LX), 41 MPG Hwy (M-CVT – LX and EX), 42 MPG Hwy (LL-VT – EX-T and above), and up to 47 MPG Hwy (Civic Hybrid Sedan). While also displaying solid fuel estimates, the 2016 Toyota Corolla lags behind with lower mpg estimates of up to: 37 MPG Hwy (L and all S models), 38 MPG Hwy (LE, LE Plus & LE Premium), 42 MPG Hwy (LE Eco), and up to 40 MPG Hwy (LE Eco Plus). Overall, both with a starting MSRP of less than $20,000, the new 2016 Honda Civic brings you higher safety ratings, better fuel efficiency, and some additional standard features for a similar starting MSRP. Overall a smarter buy, we’re not surprised — yet highly pleased — the 2016 Honda Civic was named 2016 North American Car of the Year, as well as 2016 Car of the Year by Auto Guide, and took top place in the KBB 16 Best Family Cars of the Year where the Civic was named Overall Best Buy of 2016 (by the way, the Corolla didn’t even make the list). These are just some of the many specific reasons why the new Honda Civic proves to be a smart choice, a safe drive, and a reliable companion for your travels around Rochester and your many life adventures beyond. Explore the 2016 Honda Civic Sedan Now! All information presented on this page was obtained directly from www.Automobiles.Honda.com, www.Toyota.com, IIHS.org, SaferCar.gov, and www.TheCarConnection.com. Information is deemed to be accurate but cannot be guaranteed. Consumers are welcome to independently verify all facts against manufacturer data and to contact us with any questions, using the form above. Per The Car Connection. Details at Civic: http://www.thecarconnection.com/overview/honda_civic-sdn_2016, Corolla: http://www.thecarconnection.com/overview/toyota_corolla_2016. Per Toyota’s web site Corolla specifications page at http://www.toyota.com/corolla/features/interior/1832/1856/1876/1866. For more information, visit Civic: http://www.iihs.org/iihs/ratings/vehicle/v/honda/civic-4-door-sedan/2016 and Corolla: http://www.iihs.org/iihs/ratings/vehicle/v/toyota/corolla-4-door-sedan. 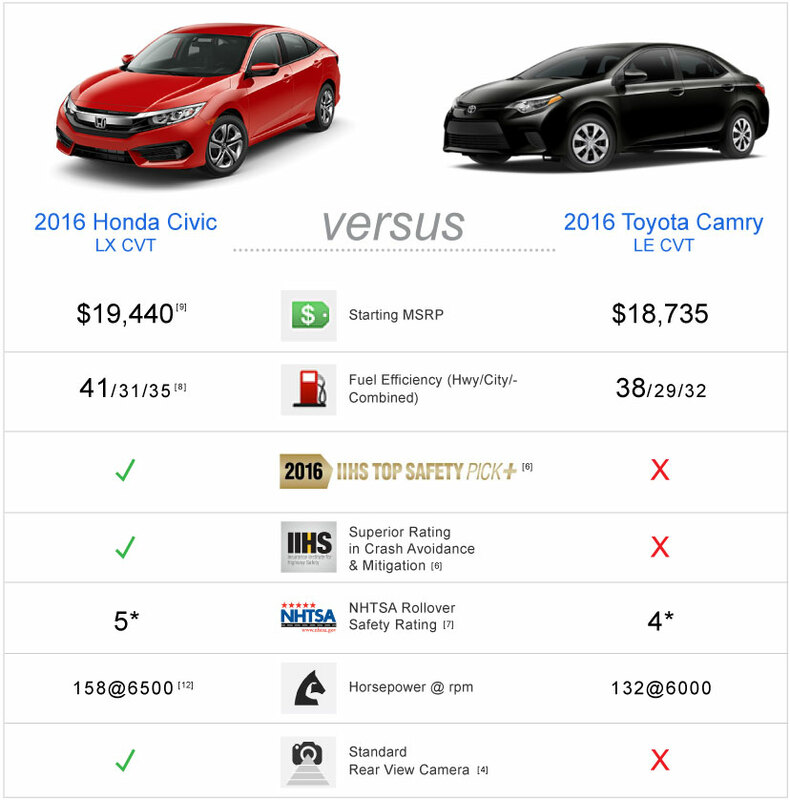 For more information, visit Civic: http://www.safercar.gov/Vehicle+Shoppers/5-Star+Safety+Ratings/2011-Newer+Vehicles/Search-Results?searchtype=model&make=HONDA&model=CIVIC&year=2016 and Corolla: http://www.safercar.gov/Vehicle+Shoppers/5-Star+Safety+Ratings/2011-Newer+Vehicles/Search-Results?searchtype=model&make=TOYOTA&model=COROLLA&year=2016. Based on 2016 EPA mileage ratings. Civic: 27 city/40 highway/31 combined mpg rating for 6MT model. 31 city/41 highway/35 combined mpg rating for LX & EX CVT models. 31 city/42 highway/35 combined mpg rating for EX-T, EX-L and Touring CVT models. Use for comparison purposes only. Your mileage will vary depending on how you drive and maintain your vehicle, driving conditions and other factors. For more information, visit AutoGuide.com. AutoGuide.com is a registered trademark of Verticalscope Inc.
 158 hp @ 6500 rpm (SAE net).